There is one thing that has always driven me nuts with Warhammer. No matter what you play, who you play as, who you are against, there is a lot of mathematics that needs to be explored within the game. Whether we realise we are doing it or not, we are always trying to work out the probability and what the best combos for our armies would be. It becomes confusing thinking “right, if I had unit X and it has this bonus, plus if I made it this size, etc.” and soon you find yourself down a deep descending rabbit hole with no prospect of return. Well, in great beardy gamer tradition, I thought I would create a spreadsheet that works out how much base damage a unit does based on its stats, the unit size, and any modifiers from outside sources. This is just the very first version, and it will undoubtedly evolve over time. For instance, this doesn’t include whether there is a champion included in the unit or not. The reason for this is because the sheet currently deals with a lot of variables, and to add more is getting too much for my tiny brain to handle. What I’ll do in this article is tell you what each section is and how it works, then there will be a link to either download or go to a live Google Sheet version at the end of the article where you can play with it yourself. It can’t have varying stats. Things like Gargants and different types of Bloodletter won’t work here. As I said before…you can’t add unit champions to this yet. You’ll need to calculate different attacks differently as opposed to together. If your Grot unit (for instance) is armed with bows and slashas then you will need to use the calculator twice – once for each attack. It doesn’t take all specials into account, so for instance the Orruk Brutes get a reroll is the target has 4 wounds or more – that would take a whole host of new calculations which aren’t in here, but it does give an idea. For this article, I will be using the example of the Crypt Ghouls (namely because I like them) and they will be assumed to be within 15″ of an Abhorrant Ghoul King. Okay, so with that in mind, let’s have a look at this Warhammer: Age of Sigmar Unit Damage Calculator and how it works. I know, it’s a thing of beauty. Look at it in all of its boxy goodness, and it’s in several different colours as well. Simply lovely. Black is a heading for the cell directly below. Yellow is a cell that is modifiable and that will need changing to create an accurate calculation. White is a cell that doesn’t need changing. These tend to be parts of formula and bits of mathematics here and there. The red and green cells show the average damage that unit will do per turn. I haven’t hidden anything because the math is quite interesting so it is all there on display. Okay, now let’s break it down. To be precise, the unit basics are what you might write down when taking a unit like, in this case, the Crypt Ghouls. First we have the really basic information – the unit type and unit size. Where filling in the name isn’t essential, it is useful if you decide to do a few of these or even a few variations. The unit size, however, is vital to calculate a few things on the sheet. One of the biggest benefits this calculator has is that it shows how big units need to be in order to deal “x” amount of damage in combat. I would encourage you to play around with unit sizes. The other basic information is the unit stats. Example stats for the Crypt Ghoul. This is fairly basic to explain. At this moment in time, you have to fill in the stats individually. Unfortunately, I don’t see any way around this at the moment – you’re just going to have to type them in. Probability to hit based on 1+, 2+, 3+ etc. The To Hit and To Wound are used to create a To Hit/Wound percentage chart using the table on the right. This shows that if you need a 1+ to hit then there is a 100% chance of hitting, a 2+ is 83.33% chance. This is the same for the roll To Wound as well. What this does is give us a solid probability, and from there we can work out how the probability changes based on what you put with the unit. We can also work out things like the additional effect of the Abhorrant Ghoul King or any units with a radius benefit. Then that gives us 66.67% chance of hitting. This is wrong. Instead we use the number of failed results to give us the percentage pass rate. In this case there are 3x results that would fail out of 6. That gives us a 50% chance of rolling a dice, getting a 4/5/6, and thus passing the roll. Of course, within Warhammer and Age of Sigmar there are always 100,000 different potential combos for any one unit. Okay, that may be a bit of a hyperbole, but it feels that way at times. We have three different types of bonuses available to units. These are bonuses applied by external units such as bosses (like the Abhorrant Ghoul King) or units (like the Corpse Cart for Zombies). There are bonuses that come from unit size (like with both Ghouls and Zombies), and there are reroll bonuses. These come in two flavours. So, first we look at external influences. This comprises of two fields in the calculator – External Modification to Hit and External Modification to Wound. This is really simple – if there is an external modifier that will give the unit a +1 to Hit then, under the box External Modification to Hit put “1”. If it gives a +2 to Wound then, under the External Modification to Wound box, type in “2” (only without the quotation marks). This will compile into the core formula which we will come onto in a bit. This gets a little more complicated when we work out modifiers based on unit size. For this we have a basic matrix, which can be used to show how certain modifiers can be applied. For this, the easiest way to think of it is as a tally for the modifiers in the book. Under each section you place the modifier based on the unit size. So, for instance, the Ghouls get a +1 Attack when there are at least 20 in the unit. This means there is a “1” in the highlighted box, under Attack and in the row starting “20”. If you had a unit with a +1 Wound if there were 30 miniatures in the unit then you would put a “1” (again, without the inverted commas) in the third cell under Additional Mod to Wound as that is in the 30 row. This would look like the below. Example 2. Note the “1” in the 30 row. Note that there are some units that get different bonuses, like Zombies with unit size. For this add them in as if they are cumulative. So, Zombies, who get benefits to Hit based on units of 10, 20, and 30 then you would add a 1 in each one of those columns. The final modifier type is that of rerolls, of which there are three types in the Warhammer world. Firstly, you can reroll all fails, you can reroll failed results of a “1”, and finally (I believe, although I am going from memory) you can reroll to wound hits. A very simple set of boxes. All you need to do is write “Yes” or “No” in the correct box. Since we are simulating a Crypt Ghoul unit with an Abhorrant Ghoul King (whom we will keep within 15″ at all time), we get a Reroll on Failed ones. Once all the numbers have been put into the calculator we see the number of average hits that unit should pull off per turn. The average damage of 30 ghouls in any one turn. Ta da! The average 30 strong Crypt Ghoul unit will do 24 damage each turn. Whether this is enough to take apart another unit, we’ll need a separate calculator – a future project. Okay, so this all works through a few key and pivotal cells. 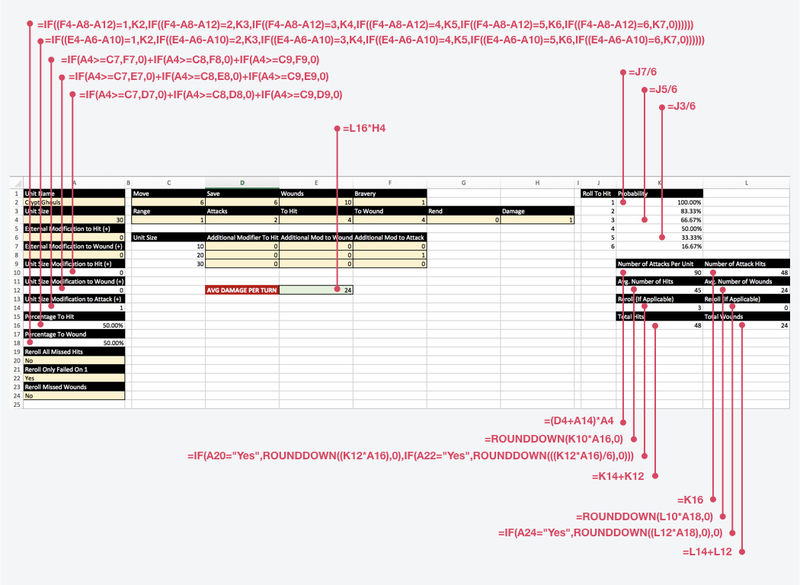 Let me show you a version of the full sheet with the rows and columns. As well as that, we’ll include the formula superimposed. Of course, I really enjoy doing this – so it wasn’t exactly a chore, but it still took a while. So, I think I’ve explained this long enough now. Now you know how to use it, here’s a link to a digital version. Please remember that this is a first go, and I can’t take all the abilities into account at this point, but this should give a rough ideas as to damage. If you click on the above link then it will take you to the calculator where I have frozen the uneditable cells and you can play around with trying different AOS units. You will need to allow for pop-ups to click on that link. Just remember this is one live sheet so everyone is sharing. So, there we have it. Let me know your thoughts in the comments below as well as any calculators for board games or wargames you would like to see. This article was actually written in April, I just didn’t publish it at the time. Instead, I thought I would finally get it out of my drafts document and take it on a test run. It’s just a simple calculator, but as I said before, quite fun to make. Ironically, since posting this my Excel skills have come on a huge amount so I have a random village generator for D&D I’m working on that works out all kinds of things using all kinds of additional formulas. Anyway, please let me know your thoughts. This is the first tool I have put together and put on this blog so any feedback would be appreciated. Ah, Math-Hammer! That’s a whole new level of detail 🙂 I’m not clear on how you’re calculating the rerolls though mate – my brain tells me that half of your 90 will miss, of which a third will be eligible for a reroll, half of which will hit, so (90/2=45 45/3=15 15/2=7.5 reroll hits (added to 45 for a total of 52.5 hits). Assuming half of these hits wound then I make that 26 wounds?? lol – doesn’t matter much to me mate – thanks to my uncanny ability to throw a rediculous amount of ones!! Oh geez, tell me about it! I recently played a game of Shadespire at the UKGE and only landed one hit in the entire game! I swear you could sometimes give me a D6 with 6 on every side and I’ll still roll a one! I feel your pain, kindred dice spirit!